Vern Blosum, Zip Code, 1964, oil on canvas, 60 1/4 x 41 3/4". Between 1961 and 1964, American Pop artist Vern Blosum produced forty-four canvases illustrating flowers, animals, and infrastructural fixtures outside his Manhattan studio. 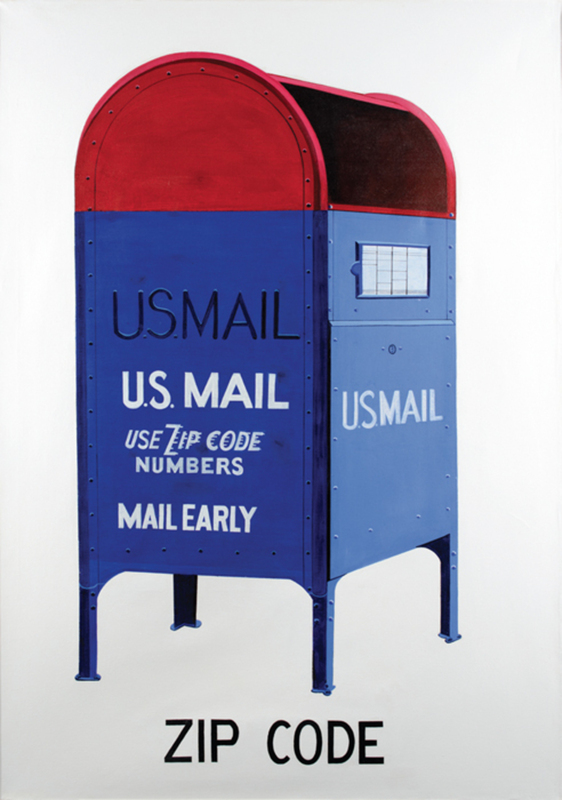 He painted parking meters, fire hydrants, mailboxes, and stop signs in a deadpan illustrational style executed with middling skill. Depicted on white backgrounds and at roughly life size, the objects float in space, looking at once ominous and dumb. The paintings’ starkly lettered captions are hardly illuminating. Appearing beneath an image of an expired parking meter: ZERO MINUTES. Below a mailbox: ZIP CODE. Below a pay phone: TELEPHONE.